As well as testing power supplies, the adjustable load can be used for testing rechargable NiMH and Lithium-Ion batteries under different load conditions. It measures the current over time, and displays the battery's capacity in mAh or Ah. This is useful for comparing different makes of battery, or for deciding whether a battery has reached the end of its life. Circuit of the adjustable load. The constant-current circuit is based on an LT3080 regulator . This uses a current reference of 10µA, rather than a voltage reference like regulators such as the LM317, and will operate down to 1.5V and 1mA. The current is sensed by a 1Ω resistor, and this is fed to the sense input of the regulator, via a 100kΩ potentiometer. Since the current through the potentiometer is 10µA, at its maximum setting the voltage across it will be 1V, so the output of the regulator will be maintained at 1V across the 1Ω resistor, producing a constant current of 1A. Bending the leads of an LT3080 to fit a prototyping board. 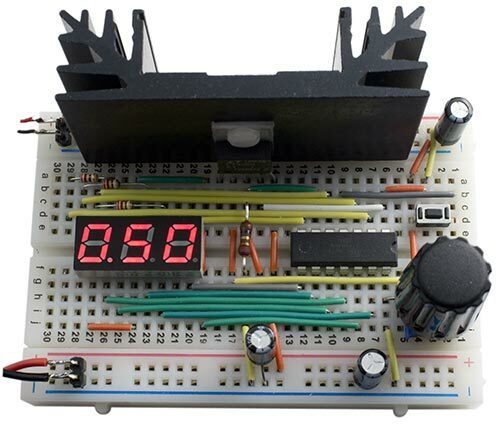 You could power the ATtiny84 and display from the power supply you are testing, via a 3.3V regulator. However, I decided to use a separate 3.7V Lipo battery because this gives two advantages: First, it allows you to test inputs down to as low as 1V. Secondly, it ensures that the microcontroller and display remain powered even when the test supply drops to zero, which is essential for battery testing. For the LT3080 to regulate, the VCONTROL voltage must be more than 1.2V to 1.35V greater than the output voltage. In some applications this pin can simply be connected to VIN, but here this would limit the minimum voltage that the adjustable load can control to about 2V. The solution is to connect it to the 3.7V supply used to power the ATtiny84 and display. Every fourth cycle this routine blanks the display and calls ReadADC() to read the voltage across the 1Ω resistor. Since the ADC is using a 1.1V reference, a reading of 1024 corresponds to 1.1V, so the current in mA is 1024/1100 times the reading. 13/14 is a good approximation to this, and avoids long arithmetic. You can measure the current with a multimeter and then adjust this ratio to compensate for inaccuracies in the value of the 1Ω resistor. The routine then calls Display() to display the current in amps or, if the current is zero, the charge in Ah or mAh. The routine Display() simply writes the three digits of the value into the array Buffer. When the current drops to zero, either because the battery is exhausted, or because you have manually turned the current to zero, the meter automatically switches to displaying capacity rather than current. For capacities of up to 999mAh the display shows the number of mAh; otherwise it shows the number of Ah, up to 9.99Ah. To reset the capacity measure press the reset button. Note that unless otherwise specified, most Lipo batteries have a maximum discharge rate of 2C, which means that the maximum current is twice their rating in mAh; for example, a 100mAh battery has a maximum safe discharge rate of 200mA. By definition, this means that a battery being charged at this rate should last half an hour. Using the adjustable load to measure the capacity of a rechargeable battery. When the current dropped to zero the capacity was shown as 650mAh. The charge calculation relies on the internal oscillator for timing, which is accurate to about 10%. If you want greater accuracy you can calibrate it using the OSCCAL register to within about 1%. Measure the frequency on PB2 with the frequency range of a multimeter, and recompile the program with different values of OSCCAL until the frequency is as close as possible to 156.25Hz. I built the circuit on a half-sized prototyping board. The layout was dictated by the heatsink, which is mounted along one edge with the regulator in the centre. The heatsink I used has a thermal rating of 6.8°C/W . With a current of 1A at 5V the voltage across the LT3080 will be 4V, so the power will be 4W; the heatsink will therefore be 27.2°C above the ambient temperature, or typically 47.2°C. This is safely below the recommended maximum operating temperature of 90°C. Prototyping boards aren't ideal for high currents, so for permanent use the circuit should be transferred to a printed circuit board. Adafruit make a convenient matching circuit board . I compiled the program using the Arduino-Tiny core extension to the Arduino IDE . Select the ATtiny84 @ 1 MHz (internal oscillator; BOD disabled) option on the Boards menu. This is the default fuse setting on new ATtiny84s; otherwise choose Burn Bootloader to set the fuses appropriately. Then upload the program to the ATtiny84 using the Tiny AVR Programmer Board; see ATtiny-Based Beginner's Kit. Here's the whole adjustable load program: Adjustable Load Program. The LT3080 regulator is rated at up to 36V, so the adjustable load can provide a load of up to 1A at up to 36V, but the regulator will need a larger heatsink for use at higher voltages. 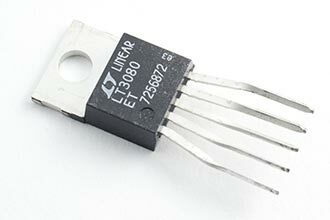 Instead of the LT3080 you could use a standard adjustable regulator, such as the LM317, for the constant current source, but because this uses a voltage reference it will only operate down to 3V. Another alternative is to use an op-amp and a MOSFET; Dave Jones describes such a circuit in his EEVBlog, using an LM324 and an MTP3055 logic-level MOSFET . ^ LT3080 Datasheet from Linear Technology. ^ Aavid Thermalloy 1.25GY50 Heatsink on Farnell. ^ Adafruit Perma-Proto Half-sized Breadboard PCB on Adafruit. ^ DIY Constant Current Dummy Load in the Electronics Engineering Video Blog, EEVblog.